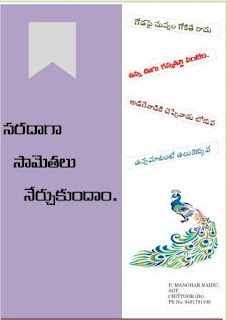 "Saradaga Samethalu Nerchukundam" telugu proverbs book is written by P.Manohar Naidu, Chittoor Dt.This Proverbs book is useful for all primary and high school childrens and also useful for adults.This proverbs use in conversation.This book is compossed with wonderful pictures.Proverbs are used in conversation by adults more than children, partially because adults have learned more proverbs than children. Also, using proverbs well is a skill that is developed over years. Additionally, children have not mastered the patterns of metaphorical expression that are invoked in proverb use. Proverbs, because they are indirect, allow a speaker to disagree or give advice in a way that may be less offensive. Studying actual proverb use in conversation, however, is difficult since the researcher must wait for proverbs to happen.An Ethiopian researcher, Tadesse Jaleta Jirata, made headway in such research by attending and taking notes at events where he knew proverbs were expected to be part of the conversations.